« Return to free phpBB 3.2 styles list. 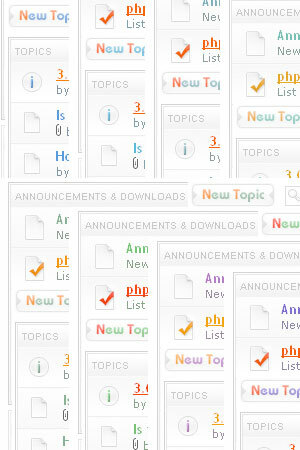 We have recently updated our styles for the phpBB version 3.2.2. As always, you are welcome to take part in the discussions available in our Forum. Your comments and suggestions are always appreciated. Choose version of phpB's forum and style from the dropdown list and press download button. Using ColorizeIt! service you can create your own color schemes for this style. You just move a few sliders to change colors, then select a new name for your style, and click "download". Language packs only include images for the default color scheme. To get language packs for other color schemes, click on the download link for the required color scheme and at the end of the page you'll see an option to include any existing language pack. To get support for this style, please visit the support forum. If you would like a custom color scheme or any modification done to this template you may submit a request by using the contact form. Please describe what you want to be done in detail, and you will receive our reply with the price quoted for the custom work. Copyright © 2006-2019 ST Software.